Are you productive? Or just attractive? We have posted much about our fish pee research (nutrient provision by the animals in their excretion), using artificial reefs as the experimental tools (here is video footage of one of our most successful reefs). 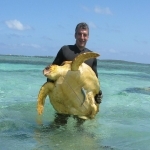 In a recent paper (link here – if interested, the Introduction and Discussion are most relevant to read in detail), we take this research a next step and apply it in the context of one of the most nuanced questions in all of coastal resource management – the “attraction vs. production” question. That is, are fishes simply moving to the new structural complex habitat from other areas (i.e., the attraction hypothesis)? Or does addition of new structure lead to changes in recruitment rates, food web structure or ecosystem function, allowing fish secondary production to be augmented to levels that would otherwise not be possible in a structure-free environment (i.e., the production hypothesis)? If artificial structures do provide for additional fish production, reef deployment could become a core component of attempts to increase fishery yields. But if they primarily serve as fish attractors, artificial reefs may facilitate over-exploitation by making extraction easier for fishers. The dichotomous view of attraction vs. production is obviously over-simplified, as there is likely a broad continuum between these two alternative mechanisms. Finding where artificial reefs fall along this continuum remains a critical question for fishery managers, yet continues to be a rather difficult question to address in practice. 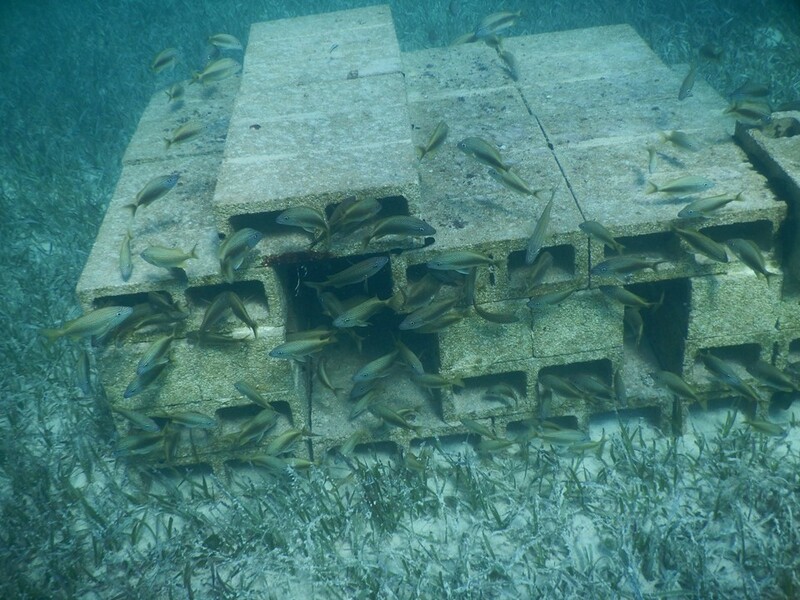 We used data with our cinder block artificial reefs to propose a mechanism that could shed light onto how reefs can really produce “new” fish biomass. The cartoon above represents three scenarios. In the first, there is no structure and fish are at low densities and dispersed widely. In this case, the nutrients provided through fish pee is largely allocated to roots and rhizomes belowground. 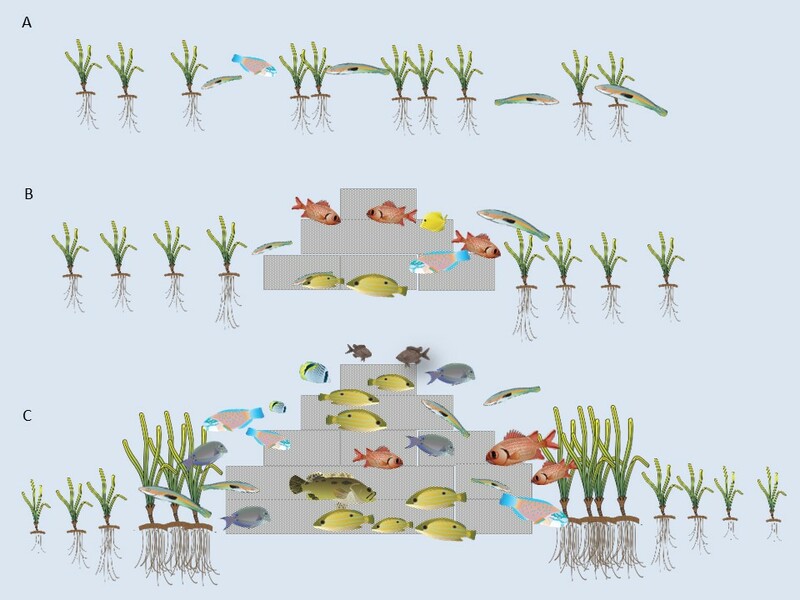 Adding some structure (panel B) provides habitat for more fish, and thus additional nutrients to seagrasses, allowing the plans to allocate additional nutrients belowground. Yet only when a certain ecological “threshold” is crossed does one see effects on seagrass blade density and growth. That is, when enough fish aggregate (panel C), perhaps around one of our larger reefs, they provide adequate nutrient supply through their pee to affect seagrass aboveground. These results can be non-linear, such that small additional nutrient provision (just a few more fish arrive) can result in large increases in seagrass growth. This enhanced growth sets in motion a series of positive feedbacks: More fish = more pee = greater seagrass density = more invertebrates can live in the dense seagrass habitat = these invertebrates provide more food for fish = more fish arrive to take advantage of the additional food resources = more nutrients are provided with higher fish densities – and on and on. This feedback cycle continues, such that the “hot spot” of action around the reef grows in size over time. In this scenario, it is very likely that many more fish can be supported around the reef than in a seagrass area lacking any structure. As such, we provide a case study suggesting it is indeed possible that artificial reefs can support “new” fish production. We are working to proffer that such ecological thresholds and positive feedbacks are critical to consider in artificial design. We exploring this idea in various ways, so lots more information to come. This is pretty cool and I have to say I’m excited to learn how you’re going to distinguish between “new” fish and the “old” fish.